Home - guidestarinc.comguidestarinc.com | GuideStar Inc.
GuideStar, Inc. helps leaders build great companies! through the principles of Character-based Capitalism. We encourage you to view the following two minute video to learn more. 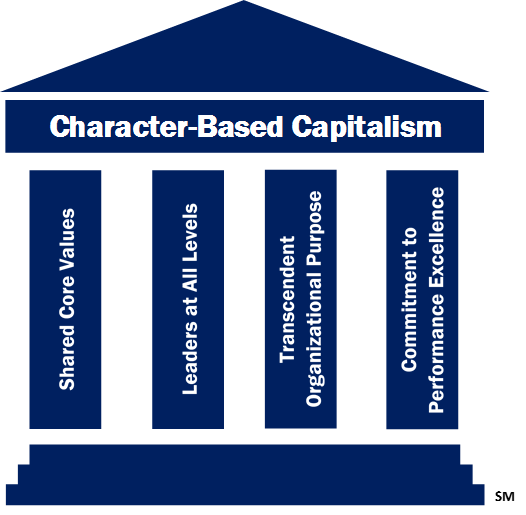 How many of the four principles of Character-based Capitalism are present in your company? Does the company have a set of explicit core values visible and “lived” throughout the organization? Companies that have shared core values demonstrate trust and care among colleagues. Employees are comfortable collaborating with each other to exchange their knowledge and ideas to create innovative solutions for market differentiation that increases service performance, growth, and profitability. Are leadership expectations clearly associated with job responsibilities? Effective leaders recognize that they do not know everything and can’t do it all. These leaders empower everyone to be a leader – to think and act like owners for contributing to the company’s success. Employees gain much knowledge from being close to operations and to customers. They are in unique positions to develop ideas that increase innovation and productivity. Companies where everyone is a leader generate significantly more profit per employee. Does the company have a clear purpose that defines the Vision and Mission of the organization? In addition to core values, a transcendent organizational purpose includes vision and mission. It enables employees to share the passion for the company’s business and feel part of something greater than themselves. Further, they have a clear line of sight for understanding how what they do makes a difference in achieving the company’s vision and mission. Employees want to come to work and make a meaningful contribution. They use their discretionary thinking to develop innovative solutions. Are employees committed to continuous improvement to advance the business on its journey to performance excellence? Employees take advantage of opportunities for continuous learning to strengthen skills in working with and influencing others, contributing ideas, improving their knowledge of the business, and getting the right things done. If you answered “no” for two or more of these principles of Character-based Capitalism, is your company showing signs of internal friction or lack of employee engagement?